Everyone has a place they hold near and dear to their heart, and Not for Navigation turns that location into a customized, lasting memento. 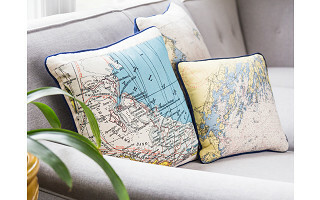 Founder Heather Jernegan paired her printing background with a love of her favorite place—the New England coast—to start this collection of charming, map-printed textiles. 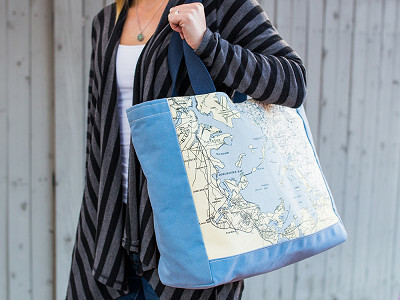 Heather takes whatever place you give her—whether it’s a specific street address or a broader coastline, neighborhood, or island—and then will select a nautical chart or topographical map that showcases that area beautifully. Not for Navigation will send the image to you for approval, then silkscreen it to enhance its details and colors. Feature the place you spent summers as a child, or a honeymoon destination, or a birthplace—the choice is completely yours. 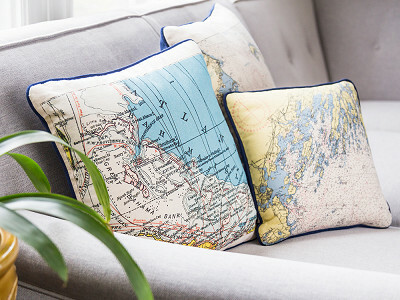 Or you could turn a memorable location into a meaningful gift, like a customized pillow. Each piece from Not for Navigation is as beautiful as it is personal. It’s worth creating a keepsake for any place that is so special. Custom marker to add to Not for Navigation pillows and bags. Hello everyone! 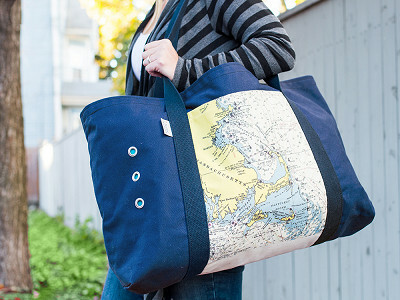 I'm proud to introduce Not for Navigation to The Grommet. I'd be happy to answer any questions you have! @Guest Thanks so much! We do have a map of the Disney World area, and sure, if the notes are simple, I'm happy to include that for you! Do you do countries like Costa Rica? @Heather Hi there, yes, we can do the whole country of Costa Rica, or we can do select portions as well. @Cindy Hi Cindy! Yes, we can create custom imagery for that area. We can focus in on Baltimore, or we can do the entire Chesapeake. Just include as much description as you can of what area of the Chesapeake surrounding Baltimore you'd like to see. The imagery provided is for approval or revision so we can always edit it :) And, yes, we can deliver by Christmas, just the sooner the better on getting the art completed. Wondering if you do only nautical maps. How about aviation maps/ charts? I'm looking for one centered on the Miami/ Boca Raton area. @Alan Hi Alan. We actually do offer aviation charts. When ordering just specify that you are interested in the aviation, not the nautical or topographic. Looking forward to creating the imagery for you! The aviation charts are neat...very different look from the chats and maps we generally use! 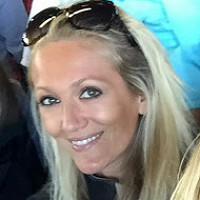 @Jenna Hi Jenna, Wow thanks for the compliment :) They do hold a TON of stuff for sure! Glad you're enjoying the ones you have already purchased from us! Thanks for that as well! Could you detail a route on a larger map? I'd like to commemorate a particular trip across several states. @Chris Hi Chris, We could certainly provide imagery of those select states, but we wouldn't be able to actually draw you're route on the map. If that is what you had in mind, we can do that for you. I love the pillow! Do you do lakes too? 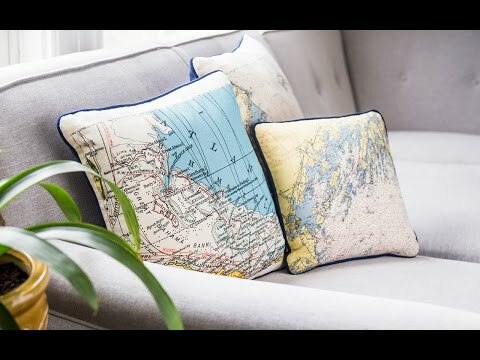 I wanted to get a pillow of Lake Winnipesaukee in New Hampshire. @Christina Hi Christina, We sure do :) and the Lake Winn map is really pretty! 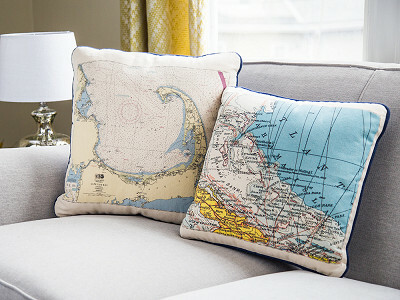 Hi Heather, I use placed my order today for a pillow of the Chesapeake Bay with an incorrect address. How do I correct this? @Nanci Hi Nancy, Thanks so much for the order! So excited to make this custom piece for you! When you receive the imagery for your order, you can also reply with updated shipping address. @Heather It's not the shipping address that is incorrect but the address that is associated with the imagery. @Nanci I see. When you receive the email from me, you can reply back with the correct area, thanks again! !